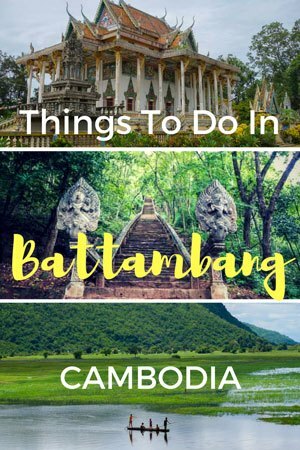 Everyone comes for the Bamboo Train, but there are so many other incredible things to do in Battambang. From the fascinating ruins of temples from the Angkorian period to the famous rickety bamboo train, Battambang has quite a lot to hold a traveller’s attention for a few days. Being Cambodia’s second largest city Battambang is far removed from the hectic busyness of the capital Phnom Penh. Less traffic, farmland and mountains located a short distance from the city centre, there is a host of attractions worth visiting – not just the bamboo train. Deciding that these places were best explored with an expert, Lesh and I decided to leave our motorbikes at our accommodation and booked a tuk tuk driver to show us the attractions around the city. At the recommendation of Mr Kun, the incredible owner of our accommodation at Battambang My Homestay, we organised a tour with one of his experienced guides. At 9am sharp we were met by Sokha, better known by his nickname ‘Happy’, a young, affable Khmer man who spoke near perfect English. After a thorough run down of the places we were going to visit we hit the road in his tuk tuk. We rode through the gorgeous Cambodian countryside, past waving children and roadside workers. Stopped to eat fresh oranges, watched a family making rice paper for their business and checked out some of the main attractions of the region. Below is a list of the best and most famous things to do in Battambang. Bamboo trains waiting for tourists to arrive. The absolute main reason travellers come to Battambang is to ride the (in)famous bamboo train. The railway used to be in heavy use between the town Poi Pet on the Thailand border to the capital city of Phnom Penh. These days it is used to transport cargo and passengers short distances to small villages. A bamboo platform is placed on two axles and propelled forward with a small engine. The train picks up a surprising amount of speed and the tracks have seen better days. You bump and bounce around as you zoom through green pastures. It feels completely unsafe (and to tell you the truth, it is completely unsafe), but it is a huge amount of fun. When two trains coming toward each other meet, the drivers figure out who will have to dismantle the train to let the other one go past. It is entertaining to watch and before you know it you are back on the tracks cruising through the countryside again. The whole trip takes about an hour, including a rest stop at the end of the line where friendly Khmer families sell food, drinks, clothes and souvenirs. The railway tracks on the bamboo train. Overgrown and rickety. Lesh and Jazza on the bamboo train in Battambang. A large Buddhist temple has been built in front of an old Angkorian ruin which gives a great contrast between ancient and new. Built in the 11th century during the Bayon period, the ruins measure 52m by 49m and are partly overgrown with moss, grass and trees. Wat Ek Phnom is falling apart and has not really been restored so crawling all over the temple gives the impression that you are the one discovering this impressive place. There are some nice bas-relief carvings above doorways and on walls. See if you can find the one where two teams and playing tug-of-war with a serpent. At the front of the site is a huge 28m high Buddha which makes for some worthwhile pictures as well. There is also an Australian-run volunteer school for young children on the premises. Understandably they request that you do not disturb or distract the kids while you are there. The new temple at Wat Ek Phnom. The old Angkorian ruins at Ek Phnom. One of the tragic killing caves at Phnom Sampeu. Better known as the killing caves, Phnom Sampeu is a huge hill that was used by the Khmer Rouge as a place to commit the atrocities that occurred between 1975 and 1979 in Cambodia. It is a haunting yet beautiful place that is best explored with a guide. Walking through the caves that were the scene of such tragic and needless acts is emotionally scarring. It is tough to see, but a must to truly understand the history of what happened during Pol Pot’s regime. Besides the caves there is a spectacular viewpoint where you can see right across the Battambang region, as well as a temple to explore. At dusk thousands and thousands of bats (the locals say over a million) move out from the mouths of the caves to form a spectacular sight as they paint formations across the sky. A beautiful Buddhist temple on Phnom Sampeu – a huge contrast from the terrible history of the mountain. The incredible view of the Cambodian landscape. The memorial building at Wat Samraong Knong. Another tragic place, this picturesque temple named Wat Samraong Khnong was used as a prison by the Khmer Rouge, located right next to a killing field. There is a large memorial close by with depictions of barbaric scenes of the different methods used to kill by the regime. Another disturbing but necessary insight into history. There is a large, new Wat being built nearby which in itself will be incredibly impressive once completed. Walking through the fields is a surreal experience. Even if you have visited the ones in Phnom Penh, this is definitely worth a visit. Heart-wrenching and disturbing, but again this is history and something you cannot ignore. A new temple construction going up at Wat Samraong Knong. The old prison used by the Khmer Rouge – A picturesque Buddhist temple. The most impressive of the Angkor temples in this region, Wat Banan sits on top of a hill 18km from town. Standing tall with five towers, it was believed to have been created as a prototype for Angkor Wat. However this has now been dismissed by archaeologists and scholars who have dated the stones to be built after Angkor Wat. You must climb up some steep steps to reach the top but the effort is worth it as you will be rewarded with amazing views in every direction. It is not often visited outside of Cambodian holidays so there is a chance you will be one of only a couple of people wandering around the temple. The staircase leading up to Wat Banan – Worth the hike! The towers of Wat Banan. This huge reservoir was created by the forced labour camps employed by the Khmer Rouge. The basin is absolutely massive and really quite beautiful. These days it is used by fisherman and farmers who make the most of the fertile lands. Located past Phnom Sampeu it is frequented by Cambodian tourists who come to picnic by the shores. There are restaurants and little stalls to purchase drinks everywhere. You can take up some of the local’s offers of boat tours around the lake which can be a pleasant excursion. Make sure you buy a fresh coconut to sip on as you walk around the water’s edge. The gorgeous view over the Kamping Puoy basin. A group of young men out fishing on Kamping Puoy. The only working vineyard in Cambodia is an interesting stop off for anyone who enjoys wine. Located on the road between Battambang and Wat Banan you can stop in to see how the grapes are turned into wine and to walk around the hanging vines. If you would like you can also purchase a bottle (or three) of their wine. This is not exactly a huge attraction, but as it is located on the main thoroughfare between Wat Banan and Battambang, ask your tuk tuk driver to stop of for a few minutes. The 28m high Buddha at Wat Ek Phnom. Us drinking fresh coconuts at Kamping Puoy. Hi! What about malaria? Did u take any steps preventing malaria? I stayed in Battambang for one day and visited the bamboo train (fun!) and a Bat cave. That was an incredible experience! Did you know about the Bat Cave? Battambang is where you come when you are templed out! Your reportage overlooks the most important aspect of this city: it’s intact colonial architecture. While most of Asian cities have been pulled down and rebuilt up, Battambang remains an architectural gem, and is an official entry for Unesco Heritage status distinctly because of its colonial heritage. Moreover, the relatively few cars parked along its roads leaves viewing unobstructed. This is like Asia 30 years ago. Battambang also is home to more artists per capital than any other in Cambodia, leading to a thriving art scene. What you don’t see here, is already hanging in New York and Paris galleries! After more than 30 years extensively travelling across SE Asia (and writing several cookbooks about the region) we opened our new luxe B&B and textile workshop, Bric-a-Brac. It is located in the heart of Battambang’s colonial district. We love this city’s calm exterior but vibrant inner workings. We also love its ancient temples. Both Banan and Ek Phnom are world quality, but please, also consider Battambang as refuge to the templed out! The bamboo train looks very cool. But the temples and other attractions look interesting too. One day, we hope to visit Cambodia :-). We hoping to make it here in 2015 🙂 thanks for info!